I love dogs, but the toys can get really expensive. This is an easy to make, inexpensive way to make a toy that really works. My dog loves it! The materials you will need is an old dish towel and a pair of scissors. Cut three one inch wide strips from one short end of the towel to the other. 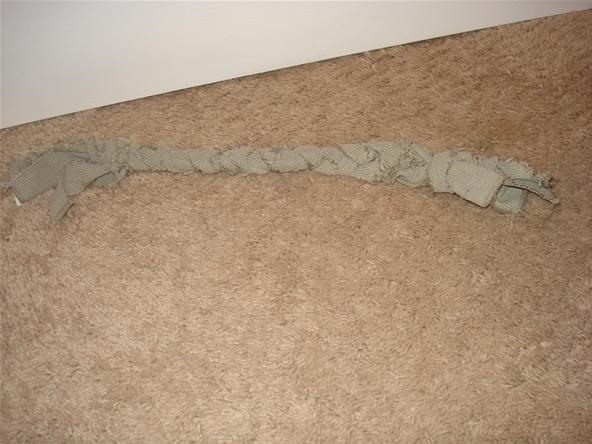 After you have done this, cut two half inch strips from the left-over towel. Bunch together the three one inch strips and firmly tie one of the half inch strips around the end to join them. Tightly braid the towel pieces together, then tie it off with the other half inch strip. Now you have a dog pull toy! This also works with napkins and orphan socks for smaller dogs. The thicker the towel, the thicker the toy will be, so keep that in mind. 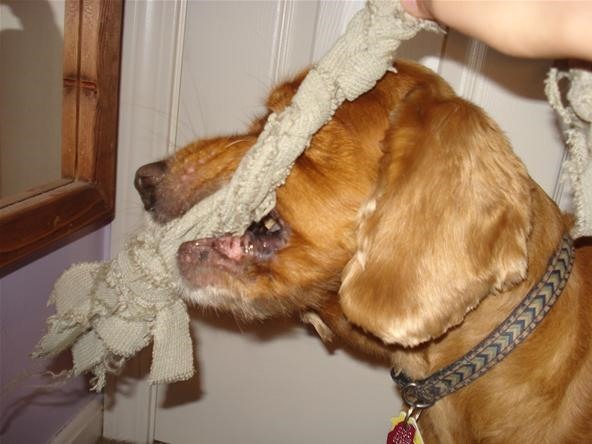 If you use a towel that has your scent on it, your dog will always go for this toy, not the $20 store bought one. Depending on your dog's size, different towels might do better. For bigger dogs, use a regular size towel. For the medium sized dogs, try a hand towel. For smaller dogs, use a napkin or orphan socks. You can also rip the fabric to make the strips. The fabric will rip in a straight line, and is faster and easier to do then the cutting. This toy makes a great gift as well!